The US National Forest Service has initiated a program aimed at developing new policies to regulate off-highway vehicle use. Central to the program is a move to generally prohibit cross-country travel, restricting OHV use to existing roads and trails. The policy and implementation teams aim to work with OHV enthusiasts as well as quiet users to develop a consistent national approach to the difficult task of designating routes in areas where OHV use has been effectively unregulated. Each forest will have latitude to take its own approach to creation of a network of designated roads, trails, and areas where OHV recreation is allowed. Among the likely challenges of this program are compiling inventories of unauthorized backcountry OHV trails (trails created by OHV users, some of which may be designated for continued use), and obtaining sufficient funding for each forest to both complete the planning process and monitor/enforce the resulting travel plans. The Final Rule, announced November 2, 2005, provides a national framework for local units to use in designating a sustainable system of roads, trails, and areas for motor vehicle use. The rule's goal is to secure a wide range of recreation opportunities while ensuring the best possible care of the land. The rule requires each national forest or ranger district to designate those roads, trails, and areas open to motor vehicles. Designation decisions will be made locally, with public input and in coordination with state, local, and tribal governments. Be sure to contact your local forests and/or regional advocacy organizations (fish and game organizations, OHV groups, and roadless area or wilderness advocates are all actively involved in every region) to participate in public comment periods or working groups that will be advising forests on route designation. On April 12 and 13, 2005, representatives of state and federal agencies, OHV manufacturers and user groups, environmental groups, and others interested in travel management gathered to discuss the potential for collaboration in managing motorized recreation. This "OHV Collaboration Summit" was co-sponsored by the Forest Service, the State of California, the Bureau of Land Management, and the National Association of Counties. Highlights of the proceedings included review of case studies in travel management, and open discussions of lessons in collaborative planning. See main OHV Program website for more info. 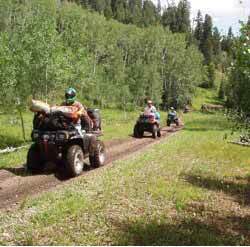 The Bureau of Land Management is also moving toward establishing better management of OHV recreation. Across the west, BLM lands are popular among both motorized users and hikers; BLM lands are often more remote, and tend to include more rangeland, dunes, and other non-forested landscapes. In general, the BLM has even funding than the Forest Service for on-the-ground presence or public maps and manuals, so recreation tends to be more primitive and unmanaged. BLM visitation is up 80% in the past decade, with OHV use being far more common than on Forest Service lands; BLM's travel planning office estimates that of the 55 million annual visits, close to a quarter involve OHV use, with another 15% centered on driving for pleasure on back roads. Many BLM units are implementing Comprehensive Travel and Transportation Management provisions as part of their Resource Management Plans; some are releasing independent Travel Managment Plans or Route Designation documents. 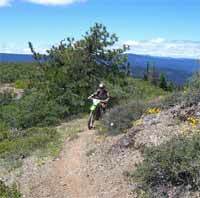 Example of an "existing" trail in Northern California that has not been officially designated. The new USFS Travel Management Rule allows (but does not mandate) such user-created trails to be included in the network of officially designated trails. Such trails are to remain open during the local route-designation phase. "existing" means routes that are visible on the ground that have previously received vehicle use regardless of whether they are on the National Forest Transportation system. Wildlands Center for Preventing Roads - One of the spearheads of the Natural Trails and Waters Coalition, Wildlands CPR has published detailed analysis of the USFS Travel Management Plan, and a citizen's guide to controlling OHV use on public lands.